Home » Aging in Place » How Much Do Walk-in Tubs Cost? Falls are a leading cause of death and injury among the elderly, and traditional bathtubs pose a particularly dangerous hazard for older people who’ve lost some of their muscle strength, mobility and balance. It’s easy to slip or trip when you lift their legs to climb in and out of the tub. The scale of the problem is evident in the statistics. The U.S. Centers for Diseases Control and Prevention reports that one in four Americans over the age of 65 falls each year when getting in and out of the tub. The CDC also estimates that an older adult is treated in the emergency room for a fall every 11 seconds and an older adult dies from a fall every 19 minutes. One way to improve safety and independence in the bathroom for anyone who’s at risk of falling because of mobility issues, is to install a walk-in tub. A walk-in tub is a bathtub with a door that allows you to walk into it without having to climb over a steep edge. When the door closes, it seals completely to retain the bath water, and it doesn’t open again until the water fully drains. With the security of the walk-in tub door, you never have to worry about water flooding or splashing onto the bathroom floor, which is another slip hazard. Walk-in tub doors customarily open outward into the bathroom but can be designed to open inward if space is at a premium. Another reason to have the door open inward is to assist bathers who move from a wheelchair to the built-in seat in the tub or a shower chair. Bathing in a walk-in tub can be a soothing experience especially in tubs that offer therapeutic features such as hydrotherapy or air jets. However, the more features on the tub, the higher the price. What you will pay for a walk-in tub varies based on a range of factors including the size. Larger tubs cost more and drive up the water bill along with the cost of the electricity or gas used to heat the water. The task of installing a standard walk-in tub isn’t necessarily an overwhelming or a particularly costly project. Installation requires removing the old bathtub and the tile that adheres it to the wall. Labor hours and costs for installing a walk-in tub are similar to what it takes to install a standard tub. A reasonable estimate is six to eight hours at the cost of $45 to $65 per hour. Installation included with purchase is frequently offered by companies that sell walk-in tubs. 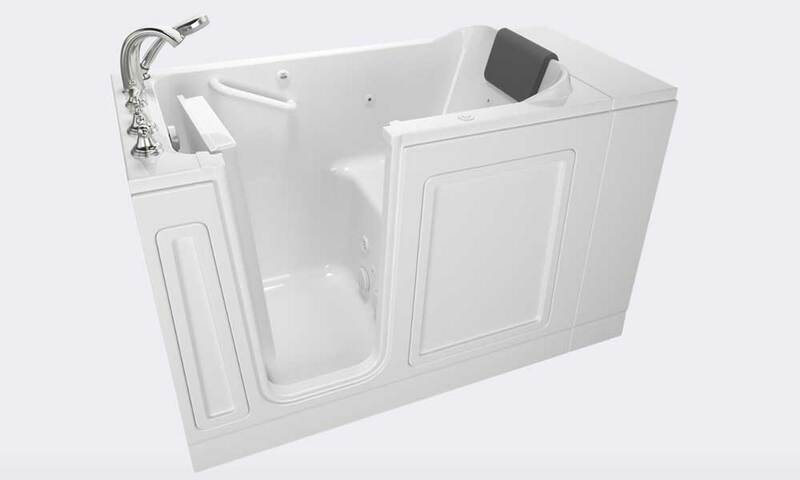 When you buy a walk-in tub that comes with more features than standard models, the cost of installation rises due to work (electrical and plumbing) that needs to be done to accommodate these features. If the tub is equipped with hydrotherapy or air jets, the expense of installation increases substantially—up to $1,500. The increased cost is due to the need to place the motor correctly and to be sure that electricity runs safely to the tub. Plumbing costs may be associated with installing a walk-in tub. Upgrading pipes to a three-quarter inch diameter will allow the tub to fill more quickly. Since a tub can hold 50 or more gallons, it may require installing a new water heater. The cost of a plumber in the United States is $45 to $150 per hour, depending on the location of the home. Keep in mind, the installation may be included with your tub. Maintenance costs are not usually high for walk-in tubs. Models that come with mechanical elements will require regular maintenance, but this usually only involves running the jets with a specialty cleaning product. The warranties offered by manufacturers vary. Be sure to look for a warranty that provides a lifetime guarantee on the door seal to prevent any leaks. Manufacturers will usually provide other warranties to cover jets and motors. Walk-in tub features directly determine price and can range from basic to luxurious with many bells and whistles. Safety features are the most important, so we listed those first below, followed by health-related functions. Easy-to-reach controls and anti-slip surfaces: Walk-in tubs usually come with a hand-held shower head for bathing while sitting down. Low step-in threshold: The standard threshold is four- to seven-inches high, but some manufacturers offer entries that are even lower. A lower threshold is safer for the bather, lowering the possibility of tripping and for more reliable access. Safety-tested: Always be sure the walk-in tub has been CSL/UL approved, which means the tub or similar units have been tested for safety. Look for any health associations that have reviewed and approved the product. The Arthritis Foundation, for instance, offers product descriptions and reviews that may be helpful. Fast draining: A bather needs to wait for the walk-in tub to fill with water after getting in and then wait for it to drain before getting out. Choosing a walk-in tub that has the technology to allow water to drain or fill quickly eliminates some of the discomforts of waiting for the water level to rise or drop. Tubs furnished with fast drains can empty in about two to three minutes. Keep in mind that the average walk-in tub holds about 50 gallons of water, and larger ones can accommodate 80 gallons or more. A backrest: Another way to reduce the chills while waiting for the tub to fill or drain is to buy a walk-in tub with a heated backrest on the seat. Even if there is no heat in the backrest, most seniors spend some time soaking in their walk-in tub as it is very therapeutic for sore muscles and joints. Sitting back and relaxing for around 20 minutes has health benefits as well. Hydrotherapy: An air bath uses a blower that produces millions of minuscule air bubbles through small air jets. Air baths are beneficial to those with diabetes or circulation issues. A hydrotherapy or whirlpool bath provides deep tissue massage and can soothe muscle aches. 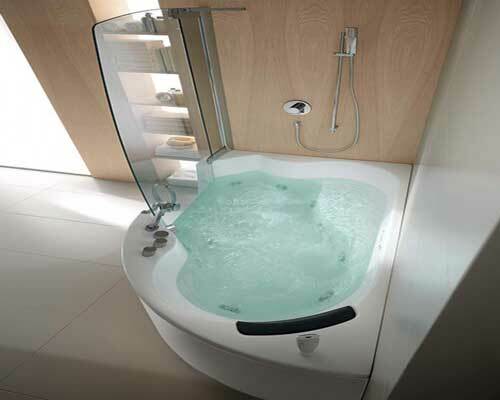 A bariatric bath works well for larger individuals or those with mobility problems. Combination tubs offer the best of both air and water jets with the option switching between the two settings. Unfortunately, Medicare does not cover the costs of a walk-in bath. The U.S. Department of Agriculture’s Rural Development Program provides grants and loans to low-income, rural homeowners to make home modifications such as remodeling a bathroom to allow for a walk-in tub. This program also oversees the Single Family Housing Repair Loans & Grants program with loans available at a 1 percent interest rate to assist low-income seniors with improving homes for safety.